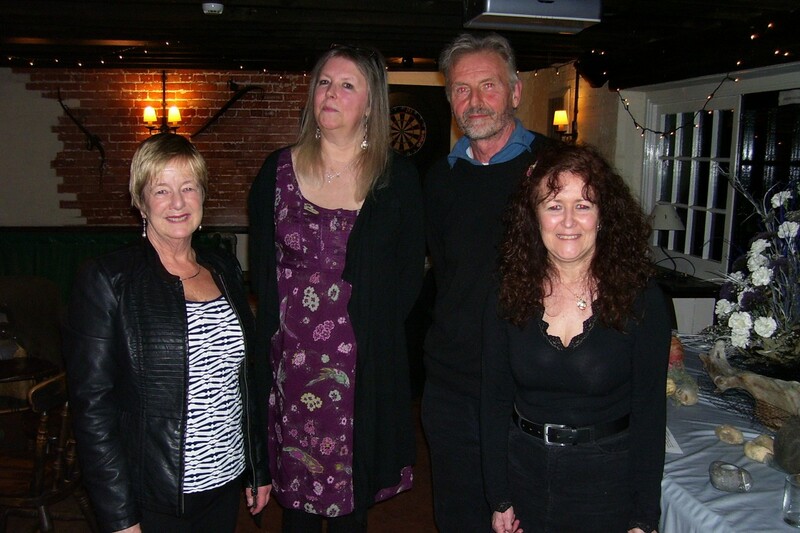 WELL SPOKEN: Judge of the Purbeck Literary Festival’s story slam Lyn Fegan, story slam runner-up Lesley Quayle, overall winner Jim Clark, who read Pebble On Chesil Beach and judge Heather Chamberlain. 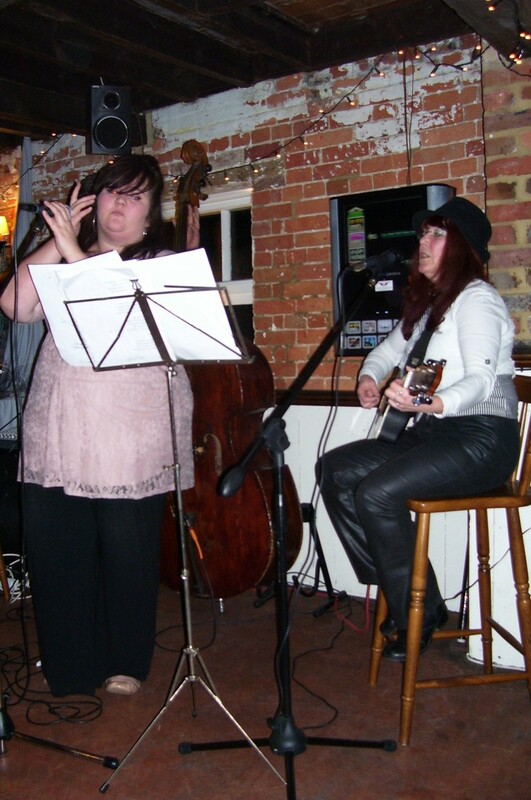 It took place at the Royal Oak, Bere Regis. MAKING MELODIES: Musical entertainment is provided as the literary judges convene to make their final decision. FESTIVAL GOERS: The turn out of amateur writers and their supporters at the Royal Oak, Bere Regis. FIFTEEN amateur writers had a war of words to see who could capture the attention of two judges at a literary festival’s story slam. 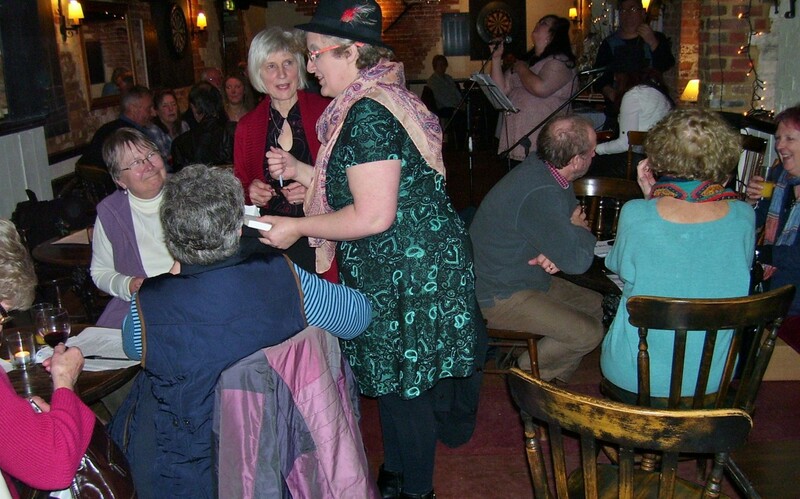 Richard Nicholson, a member of the Bere Regis Scribblers writing group gave everyone in attendance a warm welcome and it was discussed how the format of the evening would evolve at the village’s Royal Oak pub. Everyone was tucked away in a comfortable part of the establishment downstairs. All the storytellers names were put into a hat and drawn out one at a time. Each writer had to give a name to their story and they had five minutes via stopwatch to narrate it. When the clock had reached five minutes on the dot, the writer had to stop whether they or not they had reached the end. All the stories had to include the words ‘sea’, ‘grey’ and ‘pebble’ or a variant of this theme. Judges Heather Chamberlain and Lyn Fegan took a few notes and had to make sure they had recorded the name of the writer, the title of the story and the number in which they had appeared. Heather, who has previously been profiled on this blog, has just published the first of a series of books called Major Payne In Happy Bottom, the first of which is Fowl Deeds and Feathers. The next instalment, Mishaps and Mayhem is due to come out in October. Lyn Fegan – who writes as Lyn McCulloch – has published 50 short stories in magazines such as Bella, My Weekly, Women’s Weekly and The Lady. She has also had a nine-part serial published by My Weekly which was subsequently put out as a large print book for the libraries, and which has just been released as an e-book. Eight stories were heard in a row and after a short break the recharge the batteries, the remaining seven spoke after that. Writers who came up included Julie Lye, Jenny Piercey, Jo and her evocative piece The Calling Card, Richard Green, Jill Withy, Maria Lane, Enid Lee, Nick Allen, Lesley Quayle, Janet Nurse, Dave Bamber and Jim Clark. During the interlude some live music was performed and again at the end of the event Lyn and Heather took 20 minutes to consider their verdict. Lyn and Heather had not met before prior to be invited to this event but they both came to the same conclusion when they had to decide a winner and a runner-up. Jim Clark with his rendition of Pebble on Chesil Beach was both the first choice of the judges and the audience and Lesley Quayle came in second place with her effort. Organiser Jenny Piercey added: “The details of the judges can be found on the Purbeck Literary Festival’s website under events. Last night we had 50 people with 15 entries and we’re very grateful to them for coming. There were originally 17 entries but two didn’t want to read out theirs out aloud. The Royal Oak is a recently refurbished Grade II listed 16th Century coaching inn that serves traditional pub food and is half an hour’s drive from Poole and Bournemouth. The pub will have some new king-size bedrooms ready for March if anyone is looking for somewhere to stay locally.